The climate is changing. Wildlife is being lost. The seas are filled with plastic. Waste is out of control. The planet is changing hands. Amazing new personalities, talents, attitudes and ambitions are born every day and in celebration of the Year of Young People 2018, this event focuses on the planet passed on from generation to generation. Every day poses problems of a deteriorating world, but also chances to learn and take action. This event will focus on what we have seen and what we have to say about our shared world and the planet being passed on. What will you give? What will you inherit? We particularly encourage young people to attend. Can you bring a young person with you? Are you a church youth leader? There is no booking fee but we invite donations on the day to cover the venue hire and catering costs. 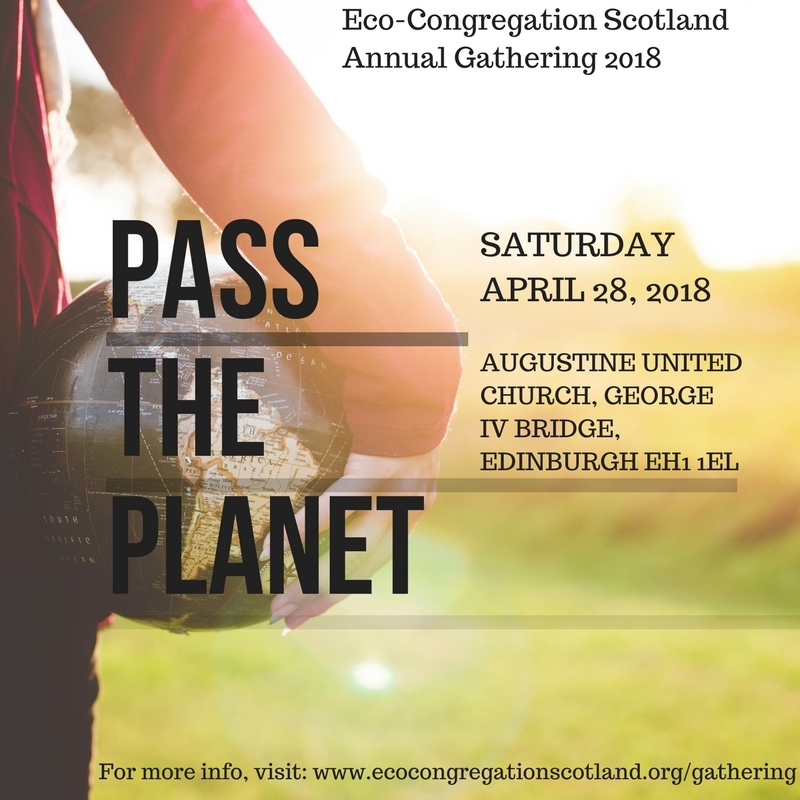 The Eco-Congregation Gathering 2018 will be an opportunity for people of all ages and back grounds to come together and discuss the future during International Year of Young People. The event will focus on the world future generations will inherit and actions we can take to make a difference. Pictures from the photography competition will be on display and the photographers will have the opportunity to share and describe what the image means to them. Ross Greer, will be speaking and collaborating to lead us through a day of discussion and ideas. In the run up to the Gathering we ran a photo competition on environmental themes. Judging is about to take place and winners will be notified shortly. The address for the venue is Augustine United Church George IV Bridge, Edinburgh, EH1 1EL (map). 5 – 10 minutes walk from Princes’ Street which serves most of the Lothian Buses routes. There is very little parking in Edinburgh city-center besides limited on-street, pay-and-display parking. We recommend using the Edinburgh Park-and-Ride if you plan on driving from afar. The building is fully accessible by wheelchair. Please ring the bell outside the church and someone will open the side door with ramp access to assist you. We will be providing a light lunch of soup and sandwiches. Tea and coffee will also be provided. Please fill out your dietary requirements on the booking form.